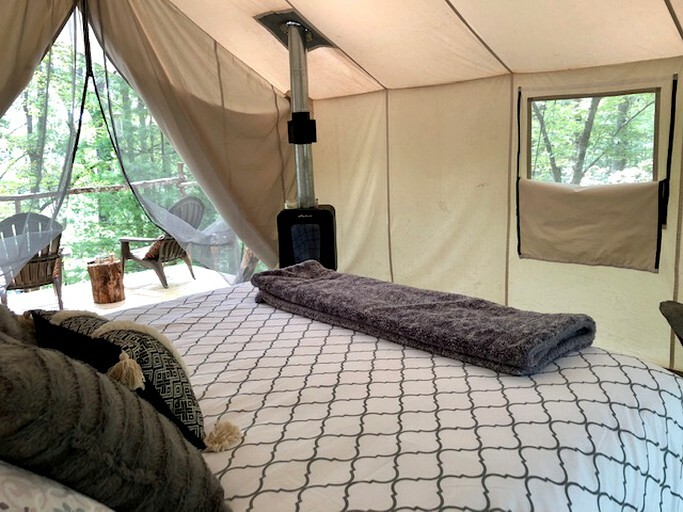 This cozy safari tent is perfectly located 13 miles from Pigeon Forge, Tennessee, and offers the ultimate glamping experience to get back in touch with nature without sacrificing modern amenities. 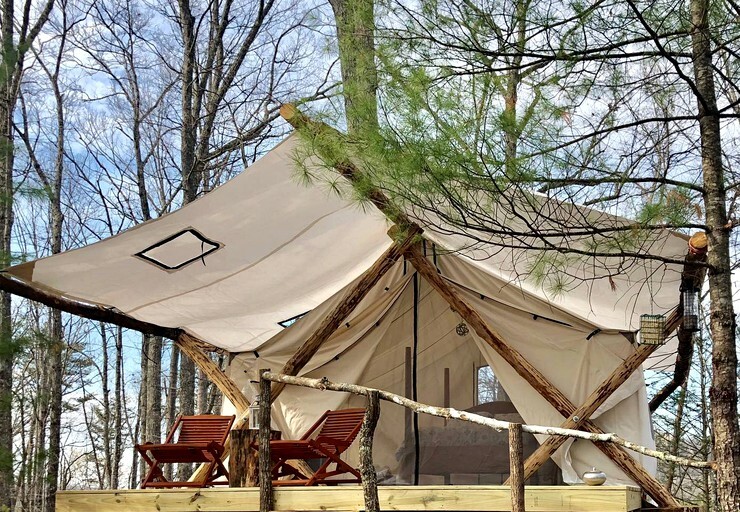 The tent boasts a queen or king-size bed with plush bedding and a night table with a lantern. 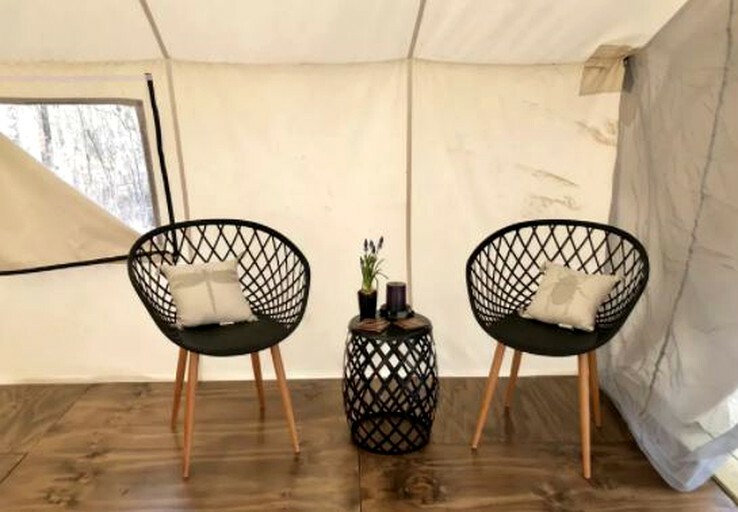 For comfort and relaxation, glampers can kick back and relax on the comfy chairs while the fireplace sets the mood and adds to the ambiance. 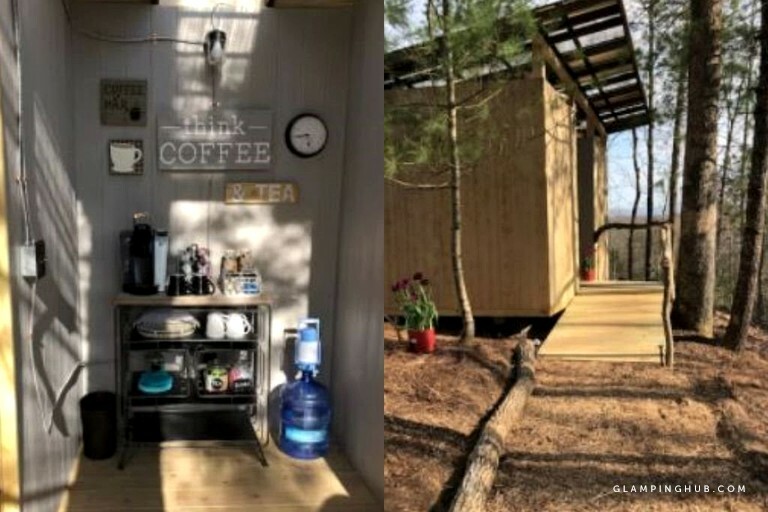 Additionally, there is a bathroom a few steps away that offers a hot shower, a toilet, and a sink, all of which add to the outdoor experience. 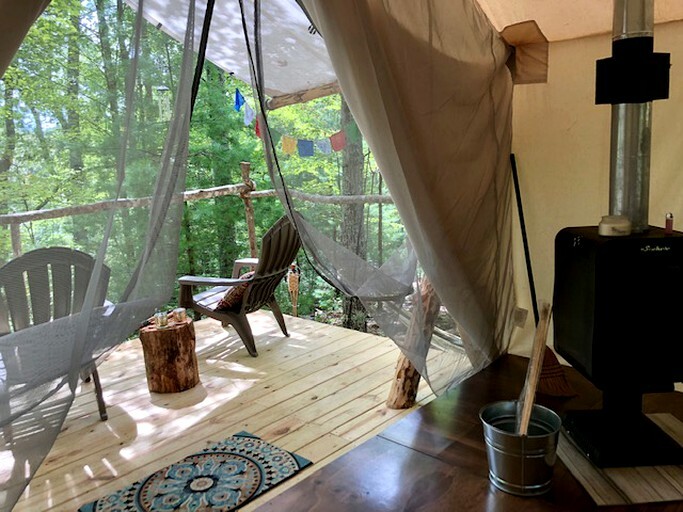 Other amenities include Wi-Fi and a coffeemaker. There is also free parking on the premises. 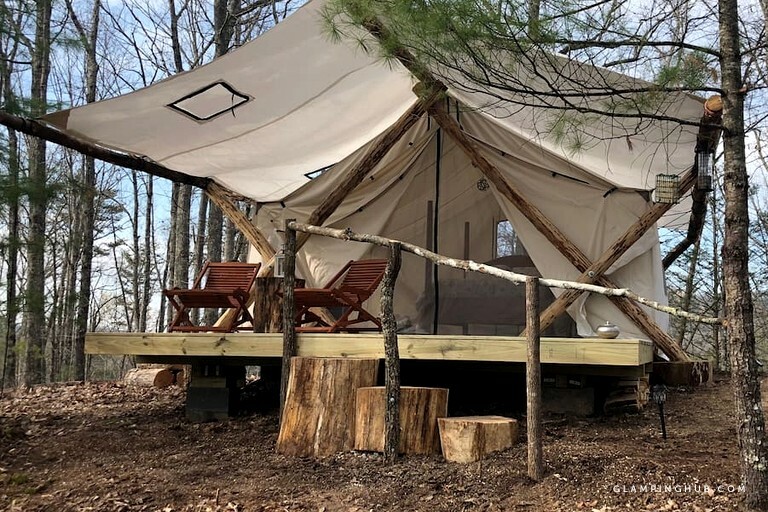 This stunning safari tent comes with all the conveniences glampers might need to enjoy a unique experience in the great outdoors without sacrificing the comforts of home. 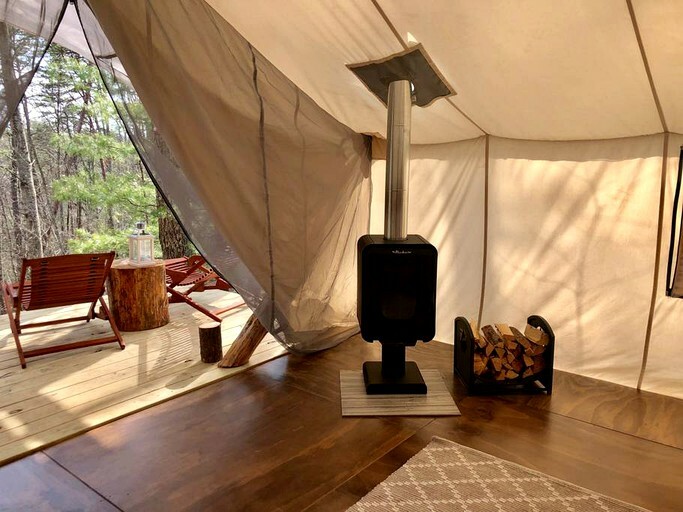 Inside, guests can find a beautiful and unique wood-burning fireplace, stocked with firewood, to ensure they’ll always have the perfect temperature indoors. 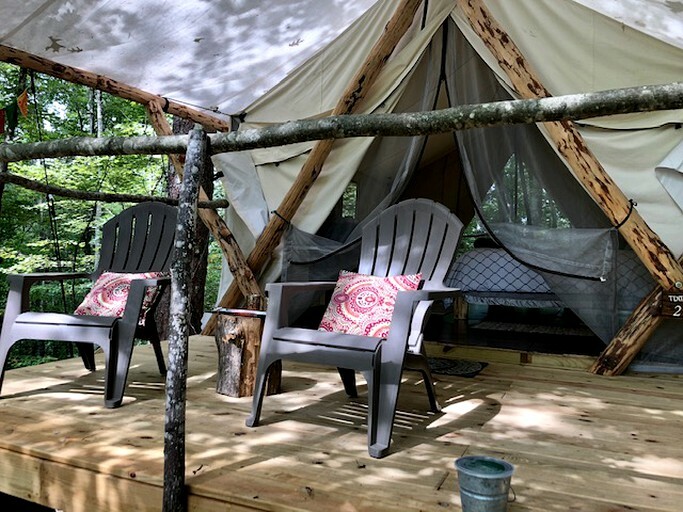 There are also chairs and tables for two, floor cushions, and cozy bed linens and down comforters. The coffee and tea bar is fully stocked, too. 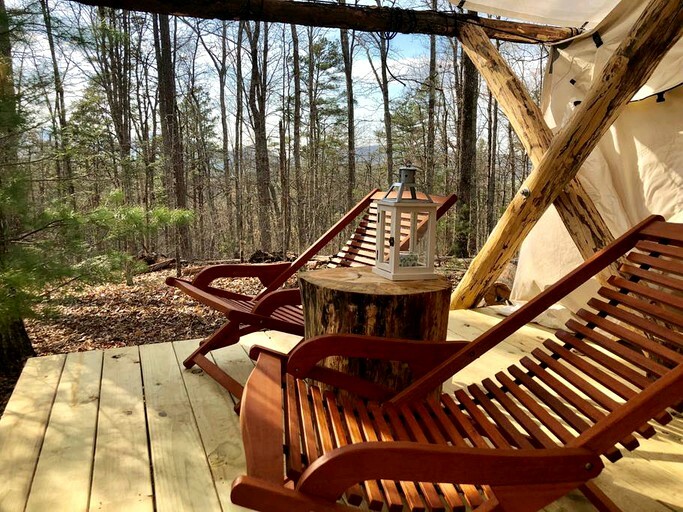 Outside, there is a nice deck with unique comfortable chairs and table, which is the perfect place for glampers to sit and relax while enjoying the spectacular views of the Smoky Mountains National Park, or the starry sky. 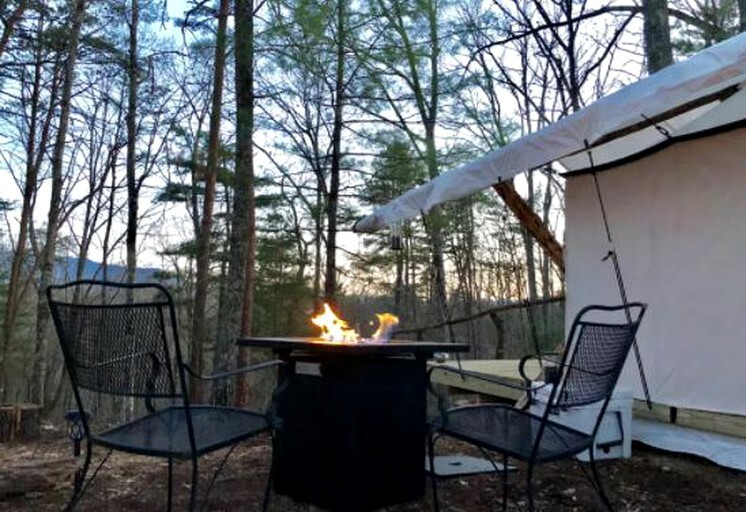 Each tent cabin has a personal fire pit and chairs, in addition to a propane barbecue, complete with utensils. 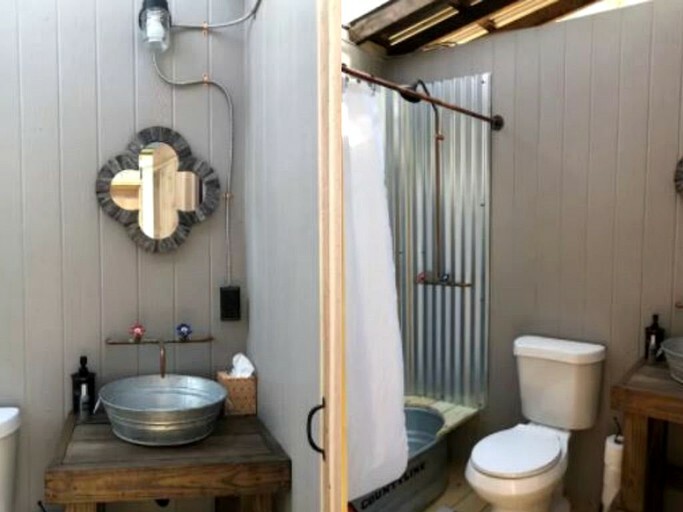 The bath house is beautifully done in a rustic, yet luxurious, outdoor theme. 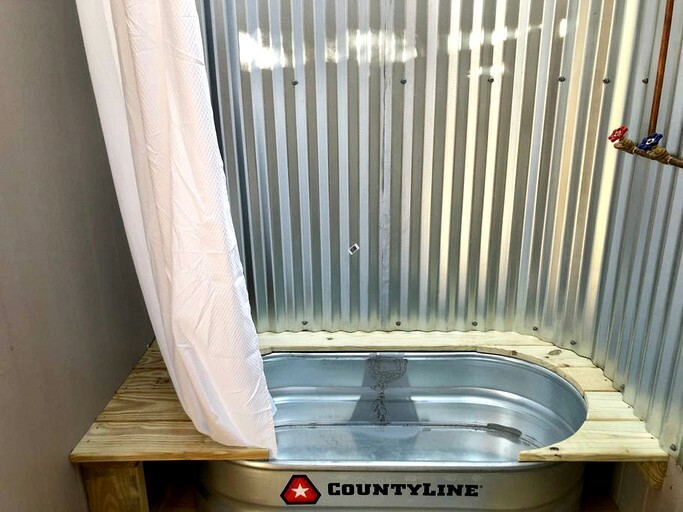 Each separate private bathroom has a unique combination bathtub and shower, a flushing toilet, and a sink with running hot/cold water. There is a nice parking area. 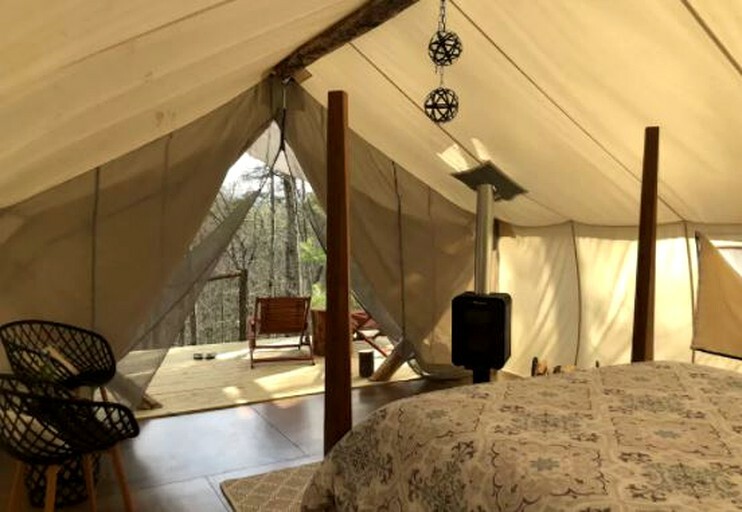 A luggage cart is provided, which makes accessing the tent with one's belongings easy. The paths are well identified and lit with solar power at night. 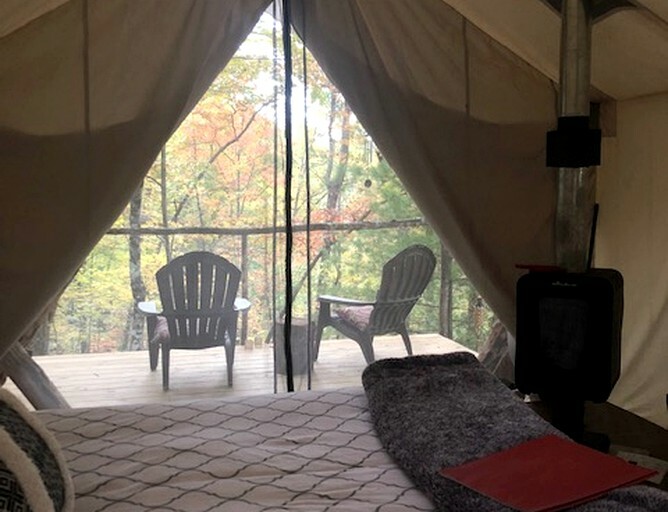 The Smoky Mountains National Park and its surroundings are known for providing unique experiences, private spaces for tranquility, and plenty of entertainment. 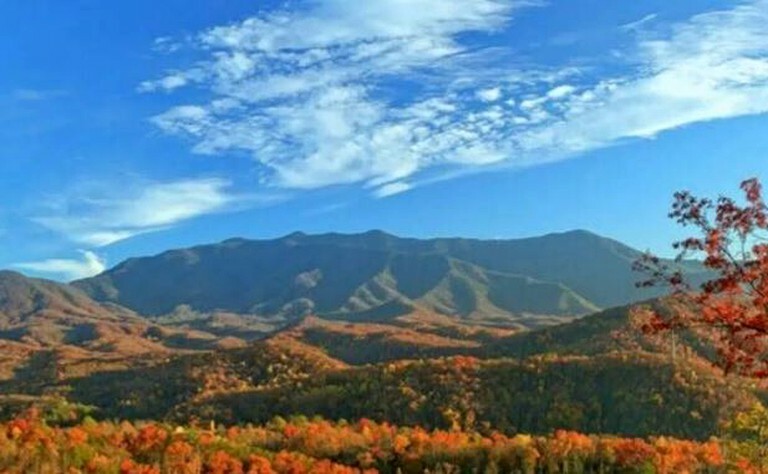 Gatlinburg and Pigeon Forge offer numerous parks, museums, shopping centers, restaurants, monuments, and guided visits. Other highlights are the movie theaters, live theater shows, and the characteristic music in the mountain parades and festivals. 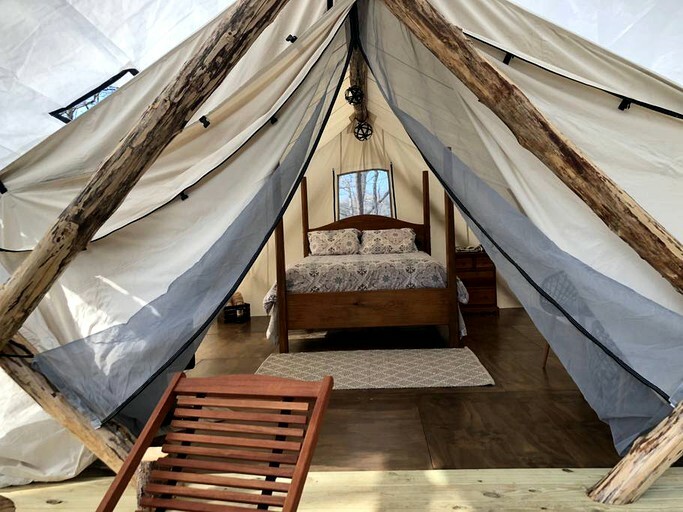 Outdoor enthusiasts will be thrilled with the hiking trails and the opportunity to enjoy horseback riding, rafting, tubing kayaking and so much more. 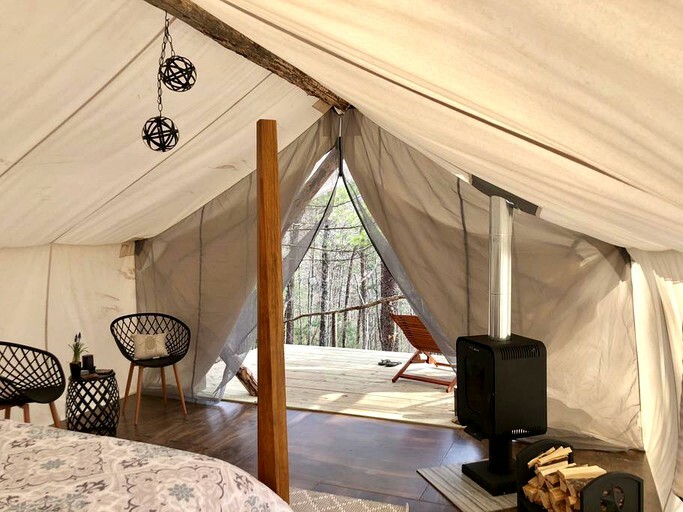 Other activities include cycling, skiing, hunting, and whitewater rafting. 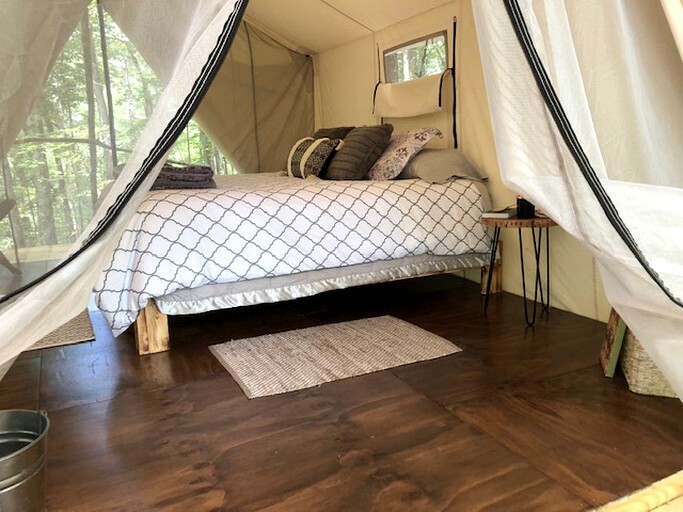 No matter the type of glamper, whether they come with family, friends, or enjoy solo traveling, glampers are guaranteed to be more than delighted when visiting this area with a plethora of things to see, do, and experience. 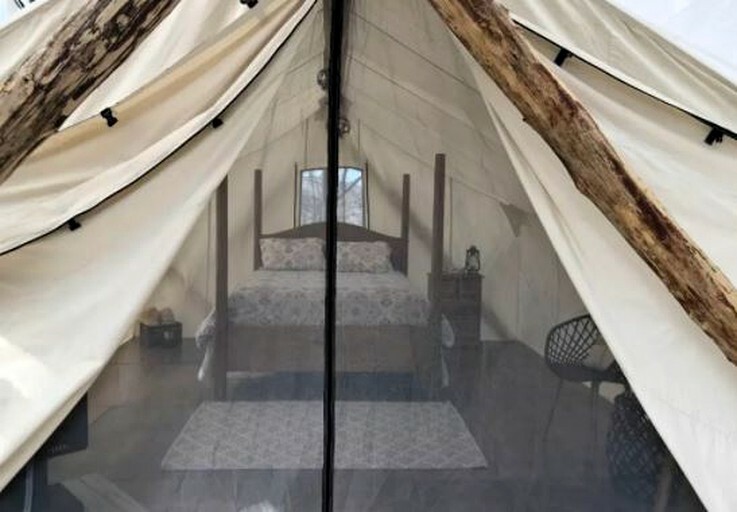 This tent is available for non-smokers only. Fridays and Saturdays are a two-night minimum. Parties or events are not allowed on the premises. Additional fees and taxes may apply and are subject to change. Guests are required to schedule a check-in time, as the host meets guests upon arrival. Guests may select a check-in time during the hours of 4 p.m. to 7 p.m.